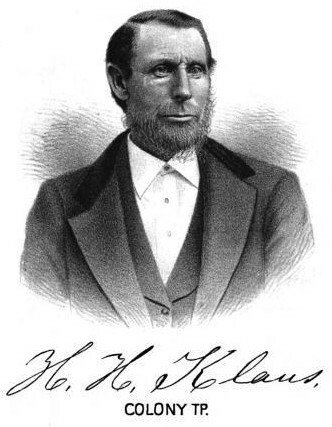 KLAUS HERMAN H. Farmer and Stock Raiser; Sec. 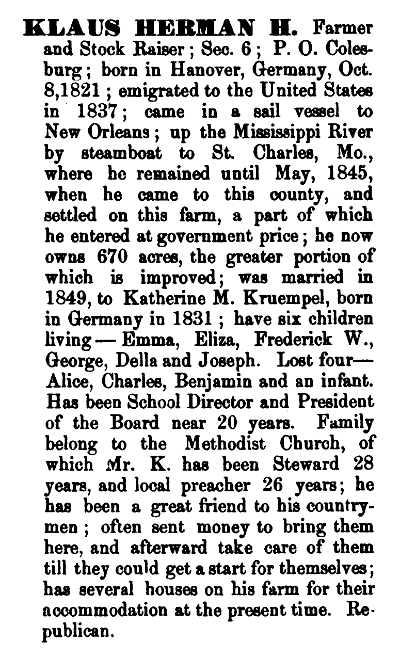 6; P. O. Colesburg; born in Hanover, Germany, Oct. 8, 1821; emigrated to the United States in 1837; came in a sail vessel to New Orleans; up the Mississippi River by Steamboat to St. Charles, Mo., where he remained until May, 1845, when he came to this county, and settled on this farm, a part of which he entered at government price; he now owns 670 acres, the greater portion of which is improved; was married in 1849, to Katherine M. Kruempel, born in Germany in 1831; have six children living - Emma, Eliza, Frederick W., George, Della and Joseph. Lost four - Alice, Charles, Benjamin and an infant. Has been School Director and President of the Board near 20 years. Family belong to the Methodist Church, of which Mr. K. has been Steward 28 years, and local preacher 26 years; he has been a great friend to his countrymen; often sent money to bring them here, and afterward take care of them till they could get a start for themselves; has several houses on his farm for their accommodation at the present time. Republican. Source: The History of Delaware County, Iowa; Containing a History of the County, its Cities, Towns, etc., a Biographical Directory of its Citizens, War Record of its Volunteers in the Late Rebellion, General and Local Statistics, Portraits of Early Settlers and Prominent Men, History of the Northwest, History of Iowa, Map of Delaware County, Constitution of the United States, Miscellaneous Matters, etc. (Chicago: Western Historical Company, 1878). The biographical sketch is from page 611; the portrait is from page 653.